With so much going on in today’s world, our level of safety can never be good enough. There are a number of things you can do to increase the security of your garage door - just read on for a number of helpful tips. Some properties have a keypad installed to allow keyless entry. They are usually installed right next to the garage door. If you have this security feature, make sure that you change the default code to something that only you and your family can remember. You should also change it frequently to prevent the risk of a passerby gaining access. Leaving your door open by mistake is one of the most common mistakes made by homeowners. This can occur while rushing off to work, taking in the groceries, or during bedtime hours. This mistake sends an open invitation to intruders, allowing them full access to your vehicle, stored property, and even the home via the connecting door. 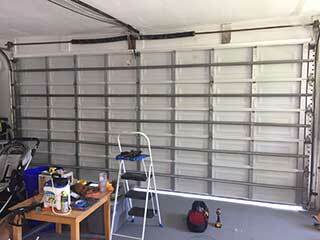 This can happen within seconds so the best way to circumvent burglary is to keep the overhead garage door closed. Always double check and if possible, install a remotely controlled option for closing and opening your door for times when you're not at home. Newer opener models come with safety features pre-installed to make it more difficult for criminals to breach the door. Out-of-date openers are far less likely to come with features such as a scrambling code system and an unidentified signal filtering feature, both designed to prevent outside third-party individuals such as neighbors and intruders from accessing your garage without permission. As mentioned, it's easy to accidentally leave the garage open, especially when there are so many people going in and out of it. Try using a door monitor that will alert the household if the garage door gets left open - it can also be programmed to close your door after a certain amount of time. This security feature is a terrific way to make sure the door remains secure as possible.